Cloud computing architecture refers to the components and sub-components required for cloud computing. These components typically consist of a front end platform (e.g. fat client, thin client, mobile device), a back end platforms (servers, storage), a cloud based delivery, and a network (e.g. Internet, Intranet, Intercloud). All of which combined makes up cloud computing architecture. 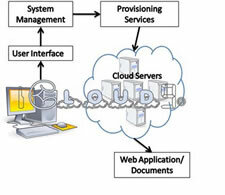 Cloud computing architectures consist of front-end platforms called clients or cloud clients. These clients comprise servers, fat (or thick) clients, thin clients, zero clients, tablets and mobile devices. These client platforms interact with the cloud data storage via an application (middleware) or a web browser, or through a virtual session. The zero or ultra-thin client initializes the network to gather required configuration files that then tell it where their OS binaries are stored.The entire zero client machine runs via the network; therefore, creating a single point of failure: the network. If the network goes down, the machine is rendered useless. A online network storage where data is stored and accessible to multiple clients. Cloud storage is generally deployed in the following configurations: public cloud, private cloud, community cloud, or some combination of the three also known as hybrid cloud. The software-as-a-service (SaaS) service-model involves the cloud provider installing and maintaining software in the cloud and users running the software from their cloud clients over the Internet (or Intranet). The users’ client machines require no installation of any application-specific software – cloud applications run on the server (in the cloud). SaaS is scalable, and system administration may load the applications on several servers. In the past, each customer would purchase and load their own copy of the application to each of their own servers, but with SaaS the customer can access the application without installing the software locally. SaaS typically involves a monthly or annual fee. Software as a service provides the equivalent of installed applications in the traditional (non-cloud computing) delivery of applications. Platform as a service is cloud computing service which provides the users with application platforms and databases as a service. This is the equivalent to middleware in the traditional (non-cloud computing) delivery of application platforms and databases. Allowing the users to have uninterrupted access their data and applications. On-demand access to resources requires the ability to move quickly and efficiently between servers and possibly even clouds. Security is always important, but when you are dealing with multi-tency it becomes much more important because you’re dealing with segregating multiple customers.